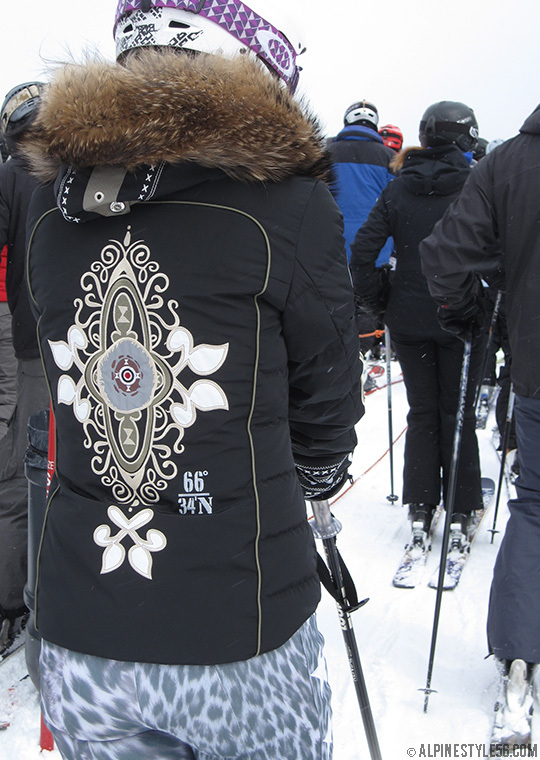 x x x x Spring skiing is here – or coming very soon – so it is time to lighten layers. The simple and clean anorak fits the bill. Fortunately, this classic style is experiencing a revival with contemporary versions increasingly available in the retail mix of lightweight, windbreaker jackets. 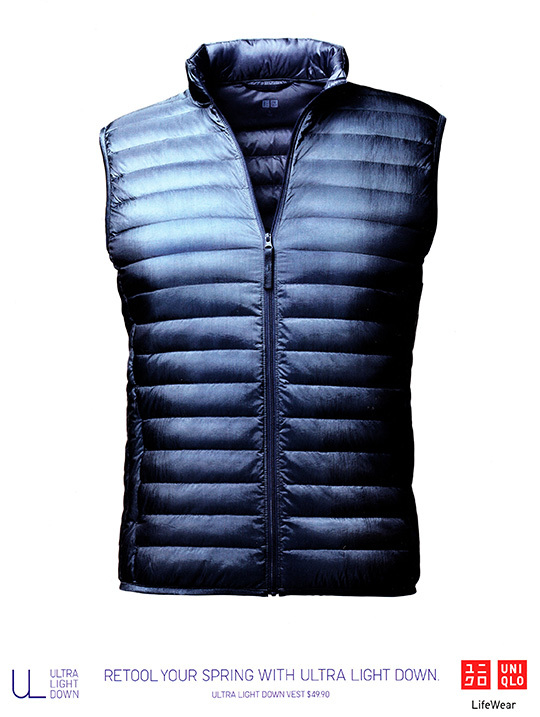 Last fall, I made no secret my love of Uniqlo’s down program – and have since lived in the brand’s ultra light down vests all winter. And now – the warmth and comfort need not stop as the fast-fashion retailer is promoting down for the spring transition season. Yipee! New styles, new colors, once again starting at $49.95. Click to see women’s and men’s. Stock up for summer. You heard right. I’m down with down year round. Try it. Shorts + t-shirt + down vest = cool coziness! 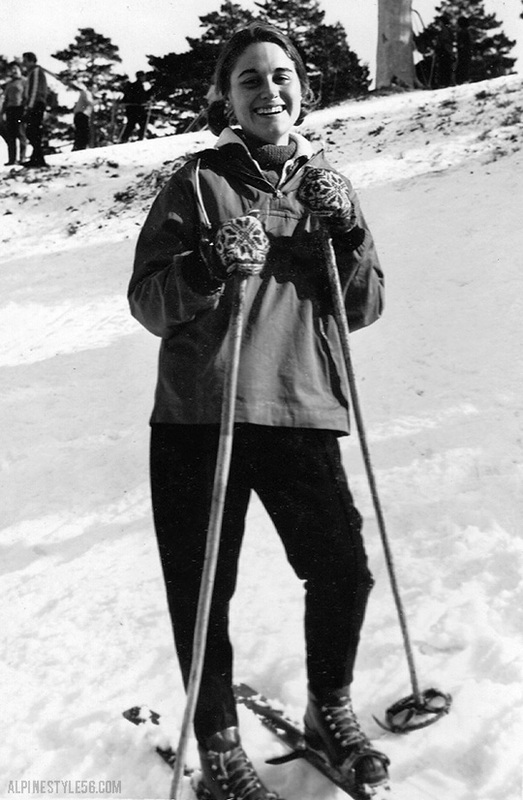 Rapha on snow! More precisely, Rapha on Bruce Rychlik on top of Burke Mountain after a morning skin up. 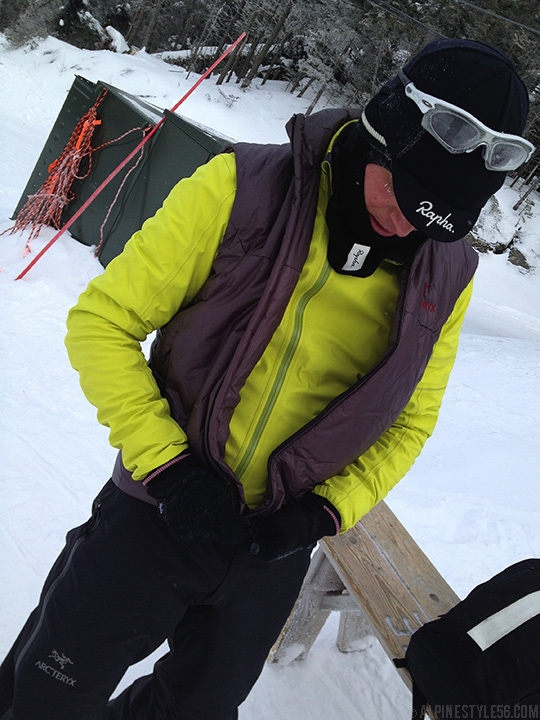 Was thrilled to see this coveted brand of cycling apparel and lifestyle put to use on snow. 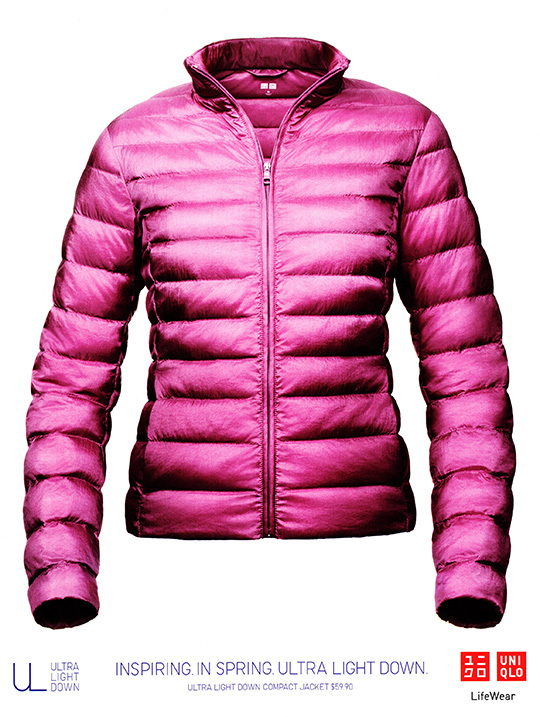 Combined with Arc’Teryx – it was a technical and stylish knockout. 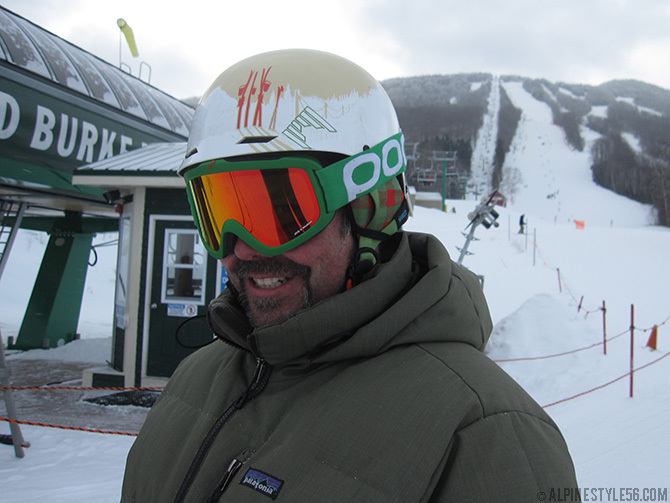 PJ Dewey of Racestock Sports wears the Shred Half Brain D-Lux helmet in the very Vermont Slopeside edition. The maple sugaring graphics are by Shawn Rice (of Magic Hat graphic design fame), the artist who created the excellent packaging for the Cochran family’s Slopeside Syrup brand. 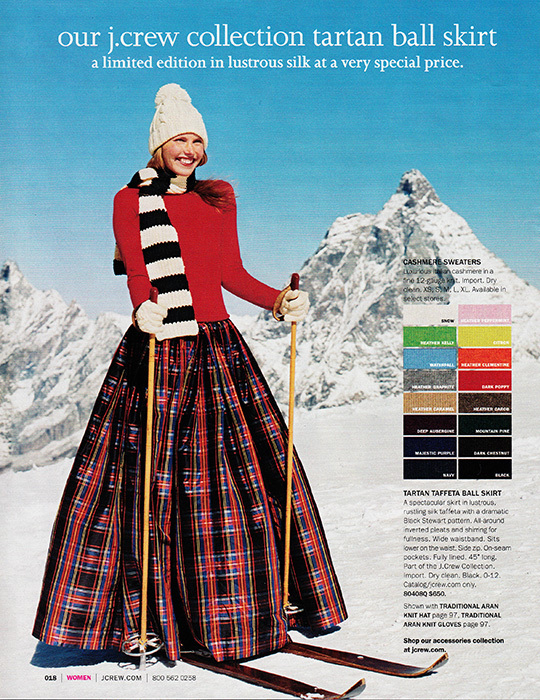 Kathy Herde is mad about plaid! 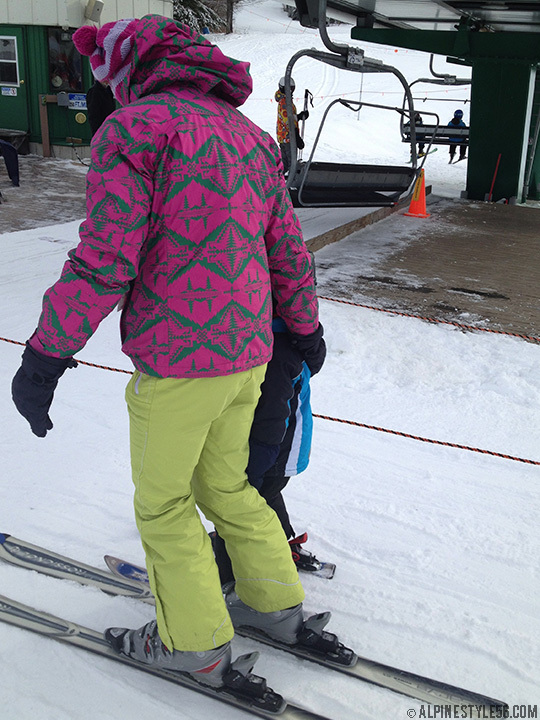 Bonfire ensemble, head to toe, to ride her Burton snowboard one day after riding her Surly Pugsley fat bike at Winterbike. 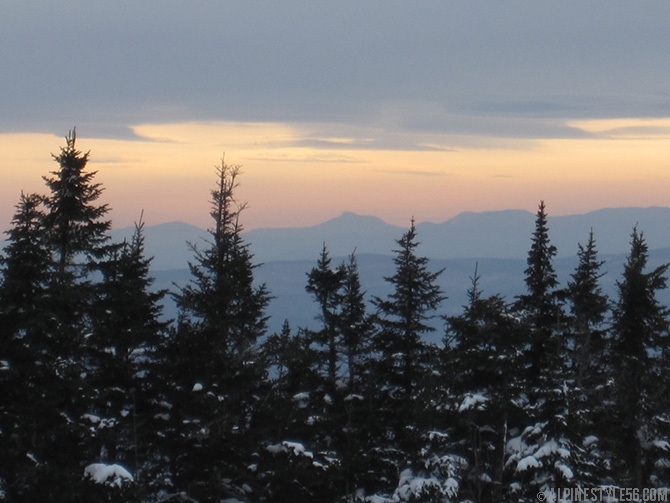 Camel’s Hump, Vermont’s third highest peak, seen through a hazy sunset from the top of the Mid-Burke Express. Last weekend was a good one at Burke. . . I am ready for another! Wishing everyone a wonderful weekend. 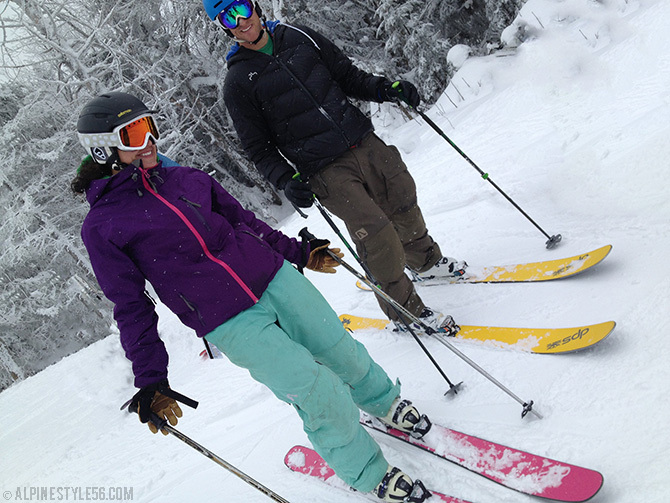 Lilias Ide, all-around ripper and Program Director of Kingdom Trails, on her DPS skis for a fresh snow ski day! Love all the color of DPS and Flylow gear. 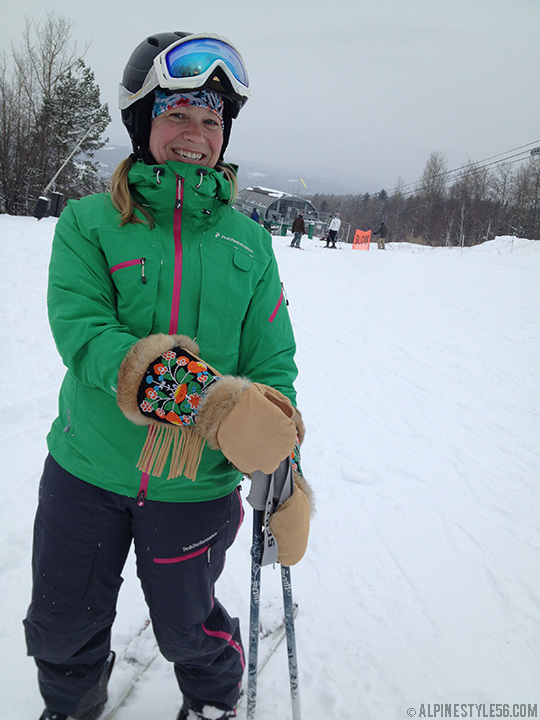 Maryanne in her pretty Astis Sacagawea mitts and Peak Performance kit. 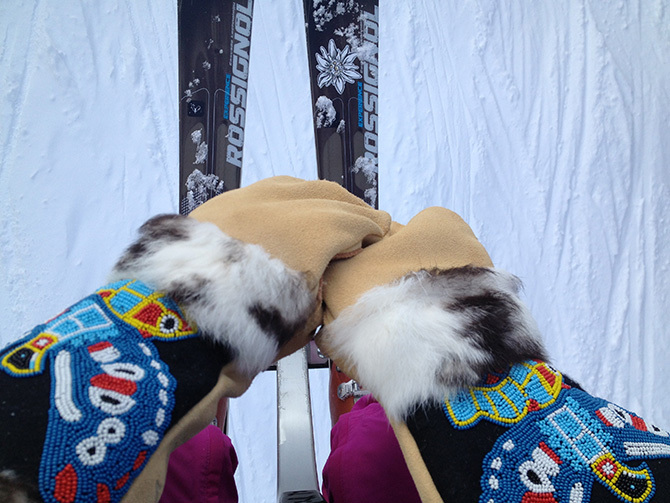 Me keeping warm in my Astis Erling mittens. 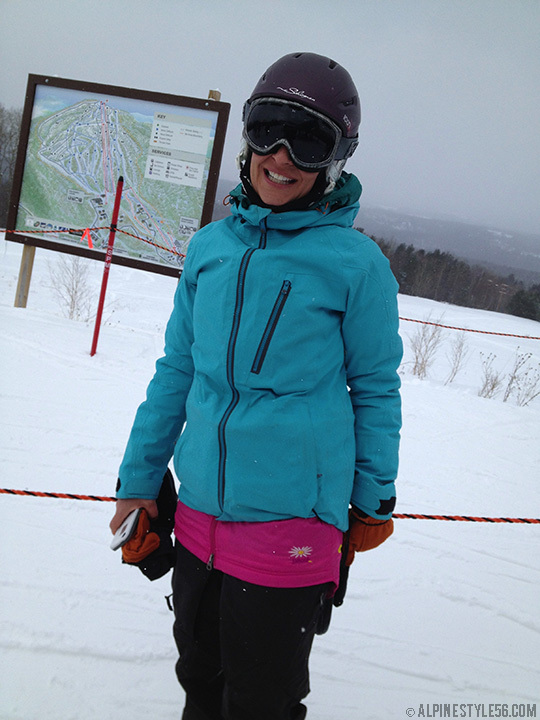 Sacha McGuire snowboarding in her colorful and cozy Skhoop down mini skirt. Local Northeast Kingdom retailer, Village Sport Shop carries Skhoop. 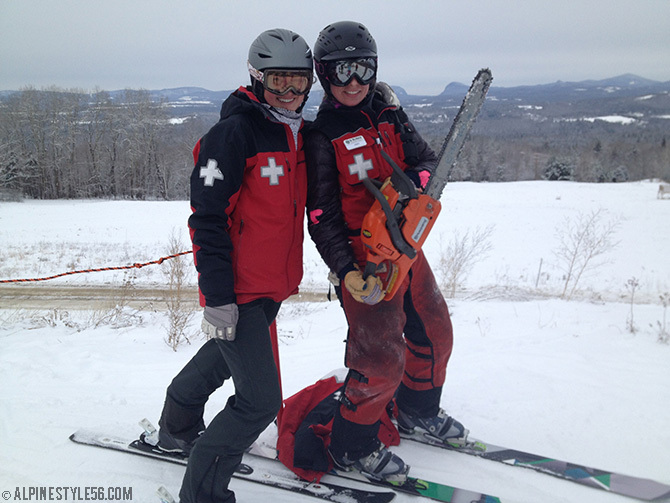 Mallory and Cody of the Burke Mountain Ski Patrol cleaning up the trails with a Husqvarna. 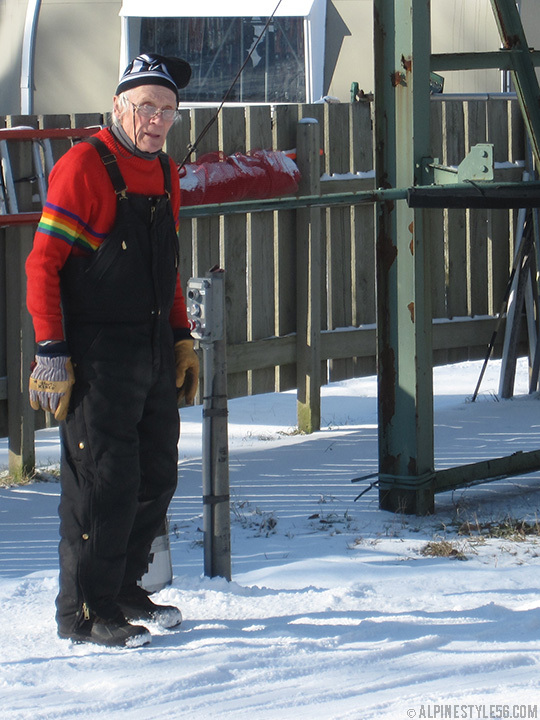 Retro rainbow ski sweater working the retro j-bar lift. 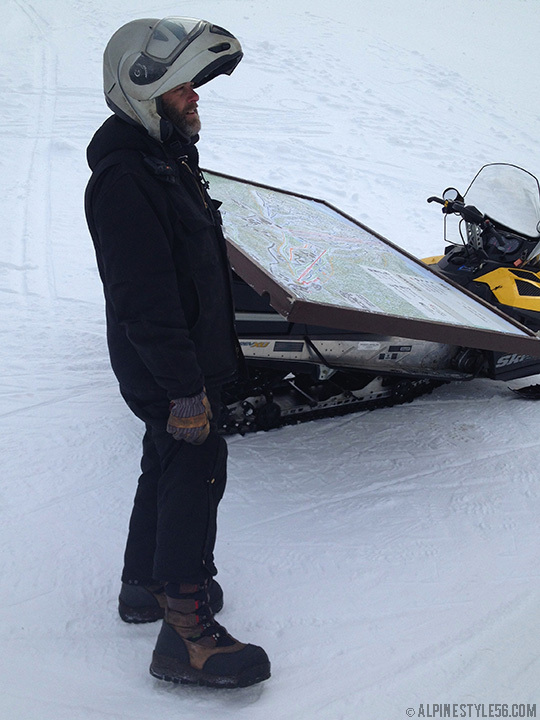 Lift mechanic Chris swears by Cabela’s Trans-Alaska III Pac boots for warmth during long shifts on the mountain. Full-on Green Mountain State park style. Love the zing of this unexpected color combo and a unique Nike jacket. 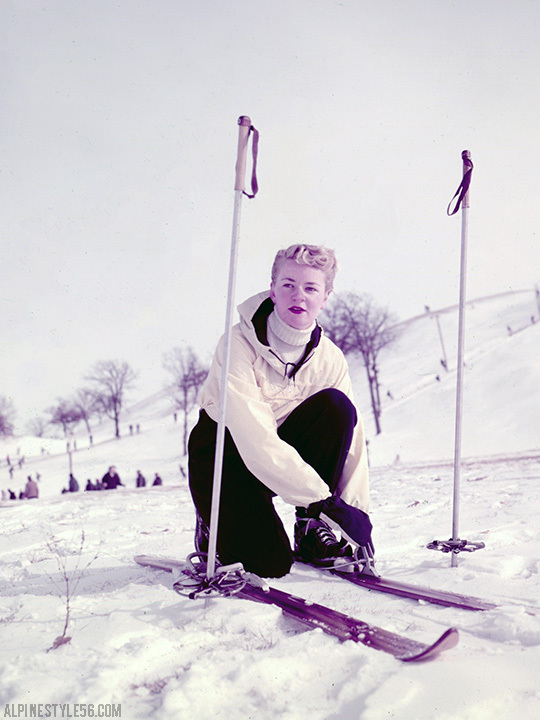 Burke is a ski racing hill. 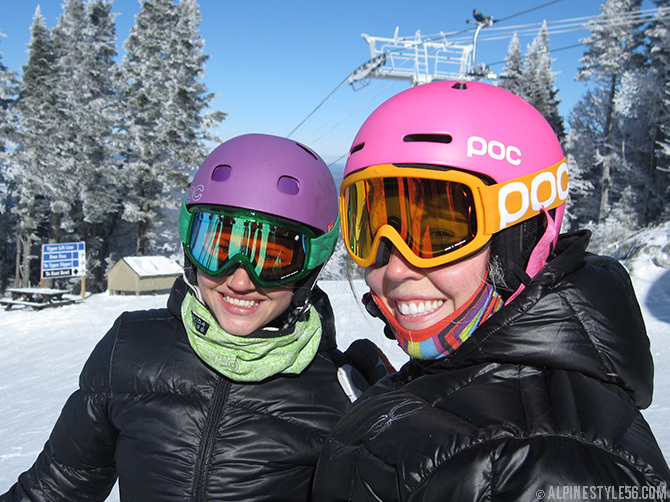 Lucky for me, I love all that goes along with that – including ski racing fashion. 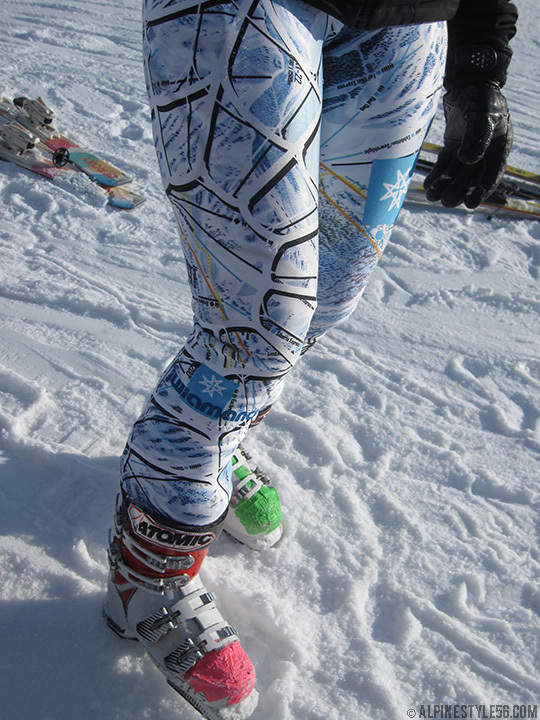 Spyder Julia Mancuso race suit featuring trail map graphics of Squaw Valley, her home mountain. Today is the opening day of ISPO 2014. Excited to see new product and inspiration! 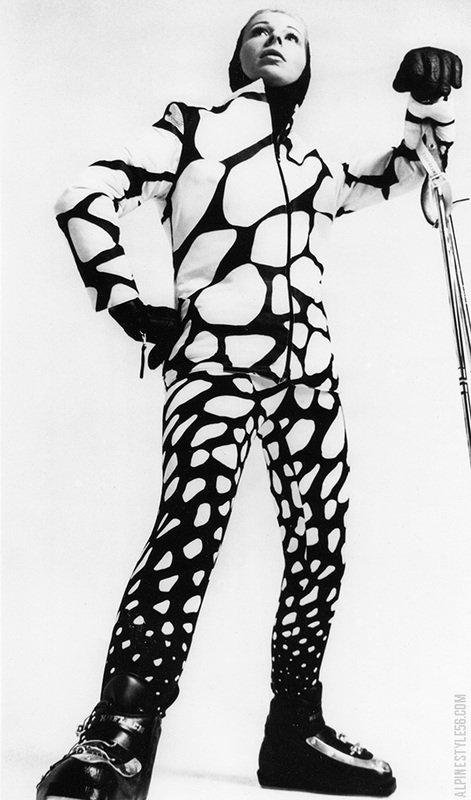 ISPO 1970: Ski apparel in graphic black and white from the first year of the ISPO trade show in Munich. The annual international trade show is the premier event for retailers to preview and place orders for new wintersport apparel and equipment. The inaugural show consisted of nearly 11,000 visitors and 816 exhibitors in total representing 34 countries. In 2013, the show claimed 80,000 visitors and 2,000 exhibitors from more than 100 countries. 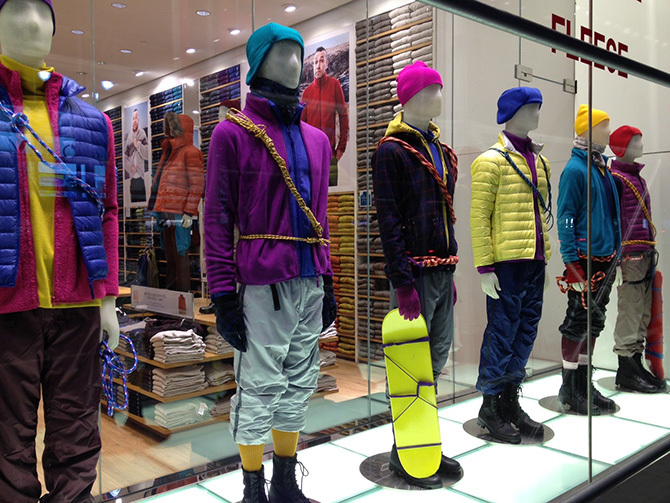 ISPO 1973: NEW SKI FASHION PRESENTED IN MUNICH According to fashion designers’ vote the female skier will look “slim and slender” in the coming season, fitting just tightly into the new colourful ski-suits which come in different colours. Some of them even show stripes or chequers or a printed pattern. Today is my birthday, forty-two! 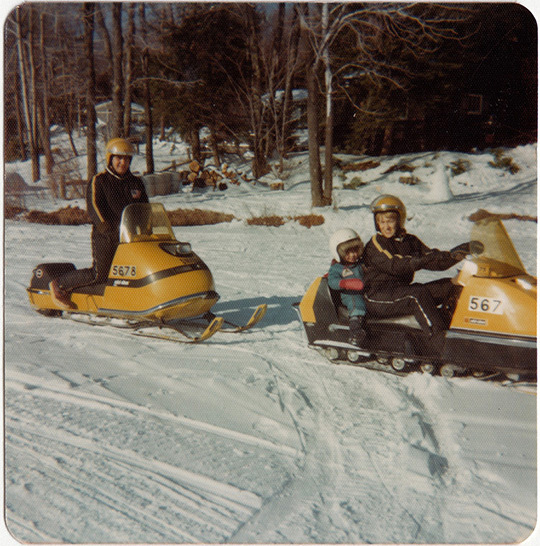 This photo was taken in the winter of 1975 and is one of my all-time favorites: Mom and Dad taking me out on our Ski-Doo sleds by our camp on Benton Pond in Otis, Massachusetts. At three years old, I was pretty into zooming around out in the snow. And I remember really liking my snowmobile gear – the fun and excitement that this specific uniform enabled, picking out cool patches for my mother to stitch on the cozy one-piece suit, the movement of the fur around the snorkel hood and thanks to a friend of the family – a custom Tweety Bird paint job on my helmet! Snowmobiling has always been a family activity for us and the first thing that taught my brother and me that wintertime is playtime. Thanks, Mom and Dad! A few weeks ago, I was able to combine a sprint shopping session with a meeting in Manhattan. I was pleasantly surprised – the city was feeling rather outdoorsy. Good timing with the onset of winter and stores ramping up for the holiday onslaught. 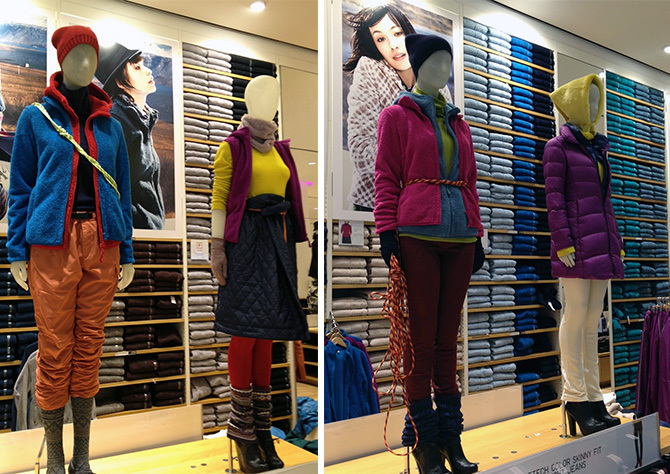 In addition to stops at Best Made Company and Uniqlo already documented, here are some more alpine and outdoor findings. Neve Switzerland Zip Neck base layer, luxurious blend of silk, merino wool and spandex. 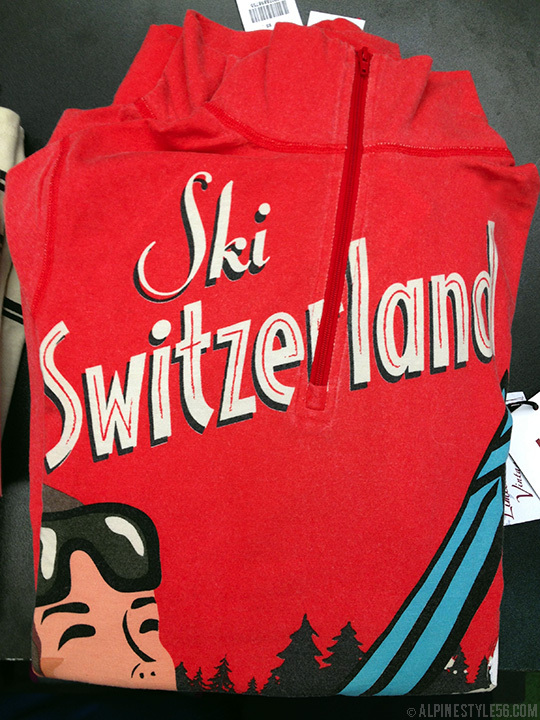 One of many designs in a series inspired by vintage ski posters. 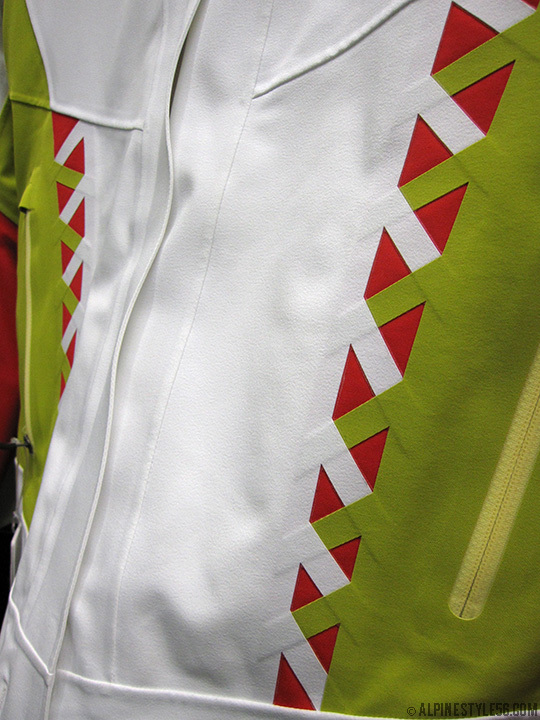 Intricate laser cut and bonded detail on Mountain Force women’s Joplin jacket. 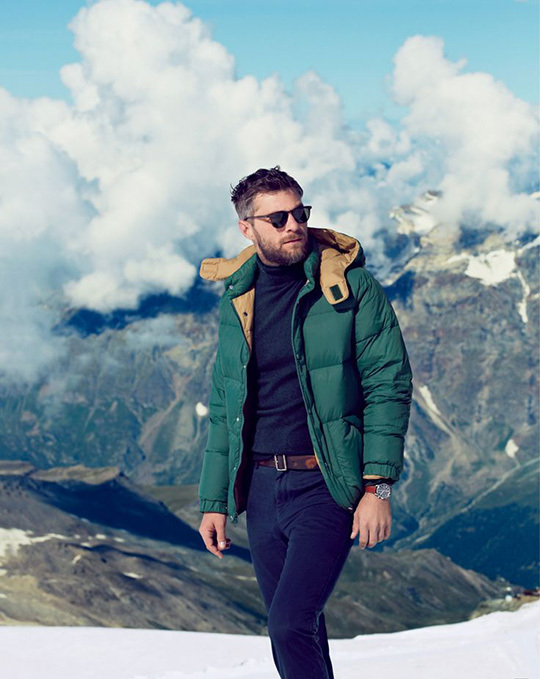 This Swiss brand is the pinnacle of technical outerwear design and engineering. 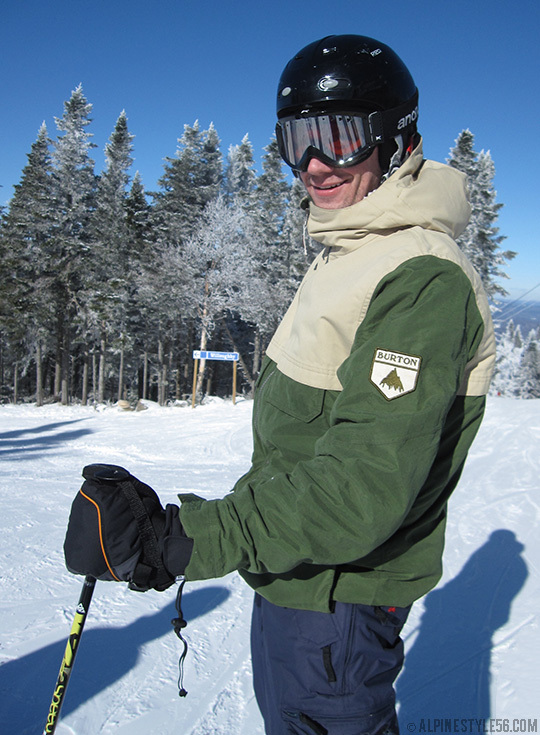 Check out this season’s line at a specialty retailer such as Paragon Sports or if not familiar with the brand, spend some time on the Mountain Force web site to get an idea of the precision in design, details and manufacturing, premium materials and covetable styling. Quiksilver’s General Insulator Jacket features a fantastic retro print combining hunting and snow themes – stags, pheasants and gondolas all co-existing in one happy outdoor world! 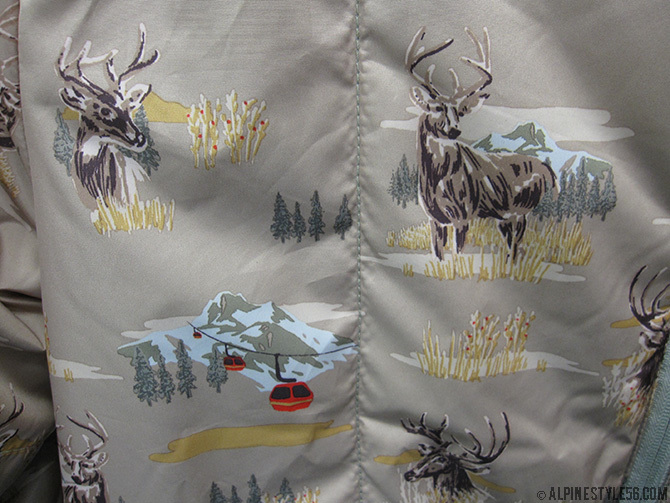 Lots of photo-real wildlife on outerwear this season. 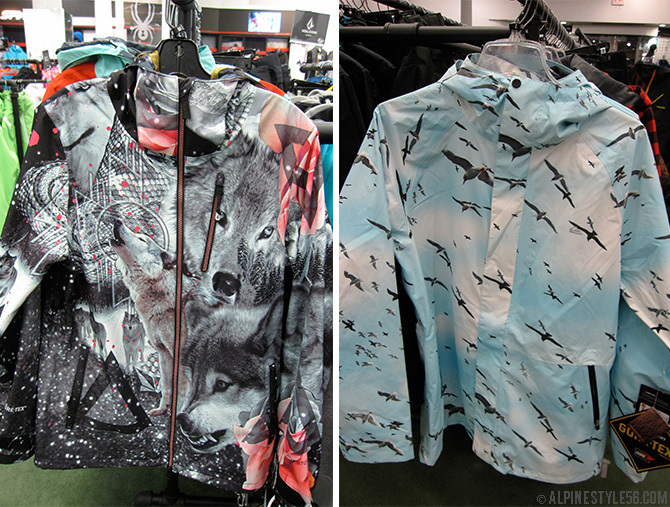 Volcom Snowboarding women’s Astrid jacket features wolves (left) and Quiksilver men’s Forever jacket with birds (right) both offer the performance of Gore-Tex in 2-layer shell construction. 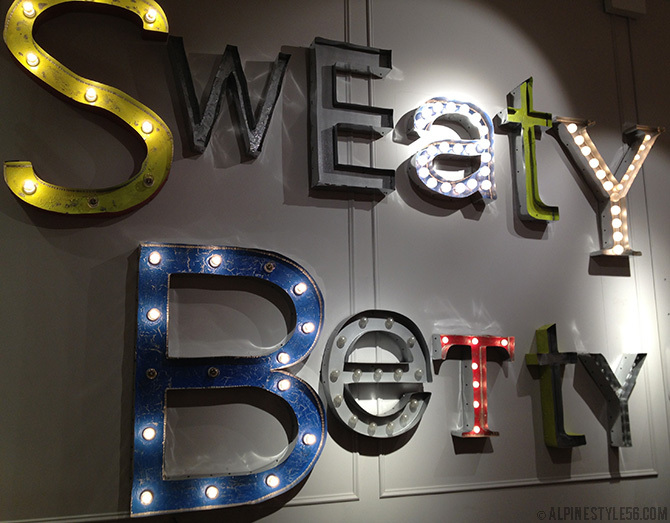 x Sweaty Betty is now stateside! The British line of women’s performance sport apparel now has retail shops in Soho and Greenwich, Connecticut. 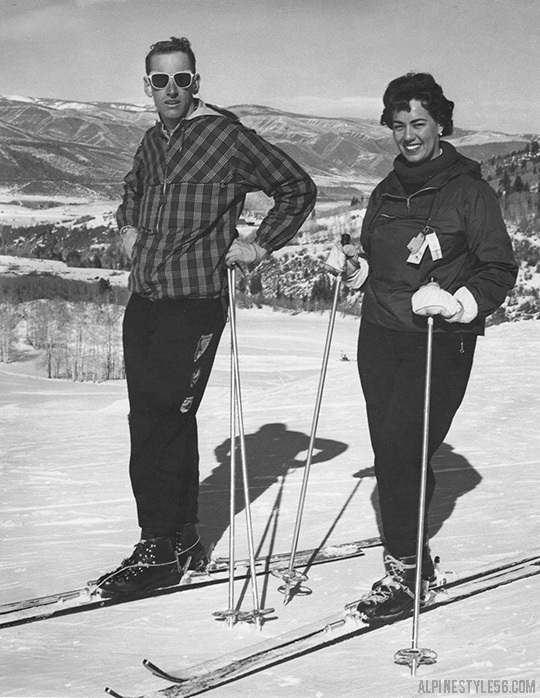 I am long familiar with the brand for workout, running and yoga gear but was surprised to learn they offer ski. 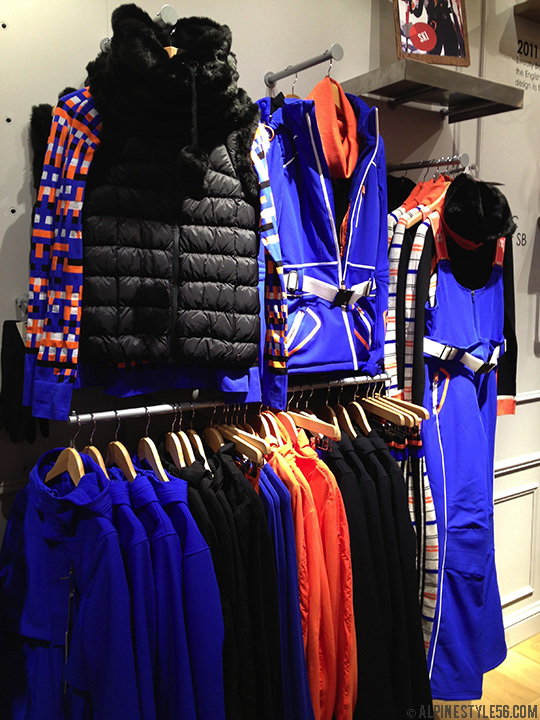 The ski collection is tightly edited with a precisely merchandised color palette. Base and mid layers come in unique interpretations and bold body-conscious outerwear bib and jacket styles give the impression of a one-piece suit. 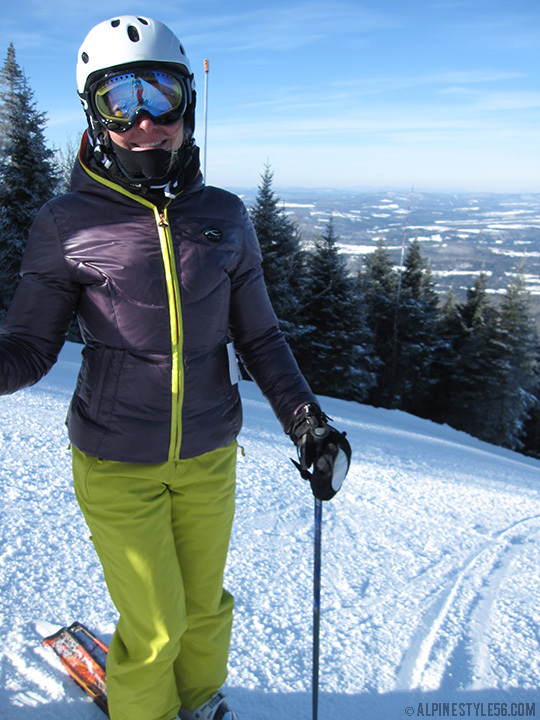 My feeling on Sweaty Betty ski and the rest of the line is this – it is not cheap (pricier than Lululemon) but is a fresh alternative to the competition and a welcome addition to women’s performance apparel. x x Over the past few years, Fjällräven has become a favorite outdoor brand of mine, luring me in with their rucksacks, tight logo and heritage to realize there is so much more. The Swedish specialty outfitter, named after the arctic fox, has a long history producing functional equipment and apparel for exploring the outdoors. 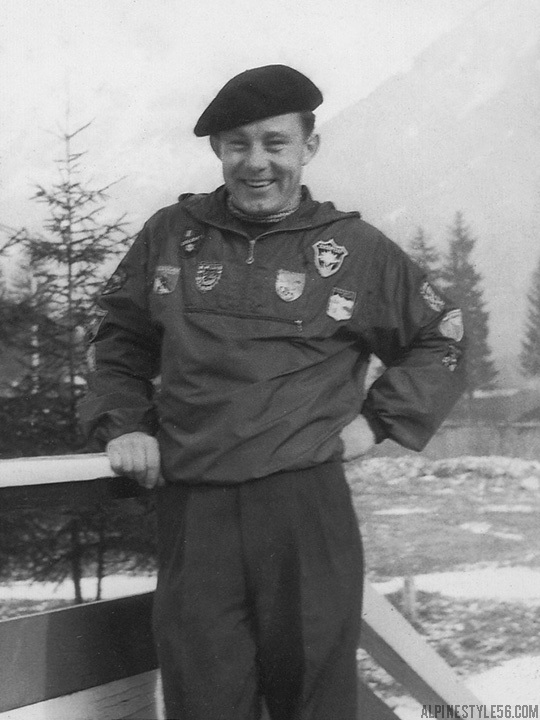 Fjällräven claims to be the inventor of the framed backpack and in 1960 became the first brand to manufacture and distribute this innovative equipment. As for apparel, Fjällräven is famous for their G-1000 waxed fabric that is durable and resistant to the elements. 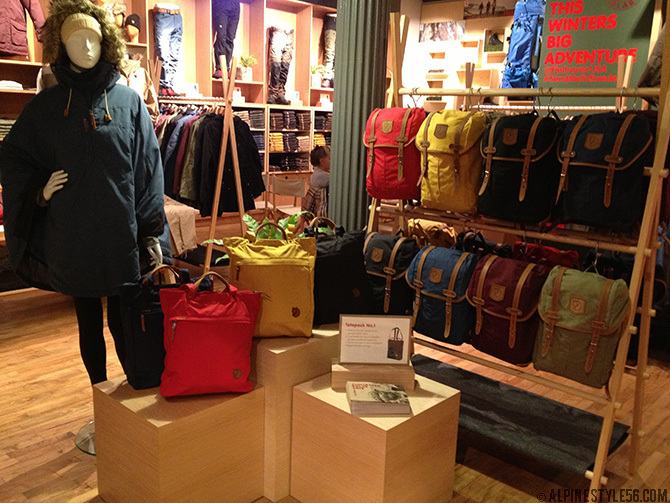 Fjällräven’s second New York City shop is located on the corner of Greene and Grand Streets in Soho. A well-merchandised store shows off the fabulous full product range – beyond the adorable and colorful Kånken backpacks most readily associated with this brand. Fjällräven products possess function and classic looks steeped in heritage and rich color for all that is involved in an outdoor lifestyle. (Yet another example of Swedish design being responsible for some of the finest sporting product available.) 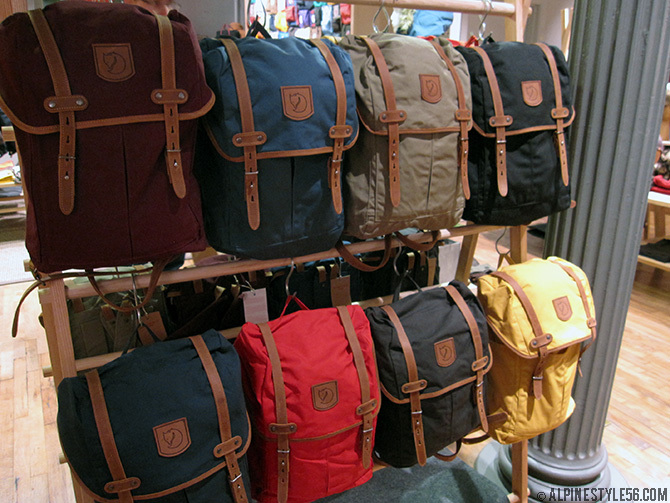 For the merchandise and shopping experience, I recommend Fjällräven as a must on any NYC shopping list. 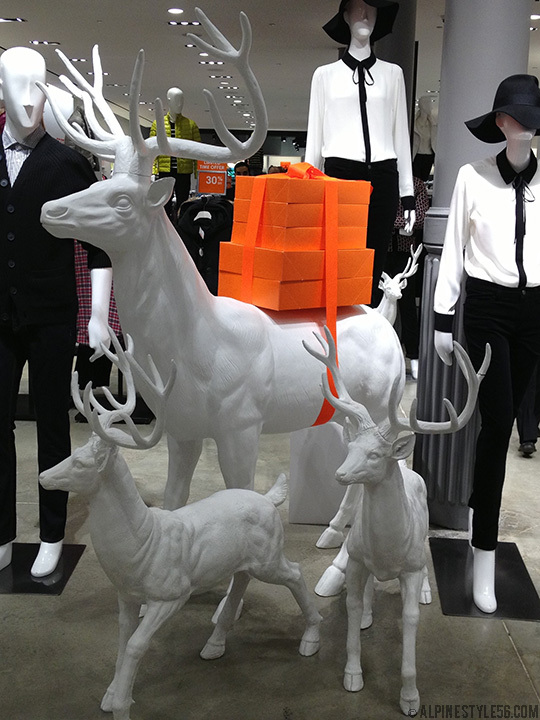 Changing gears to fashion – clean and bright Joe Fresh prominently features this shiny and white deer family for holiday. 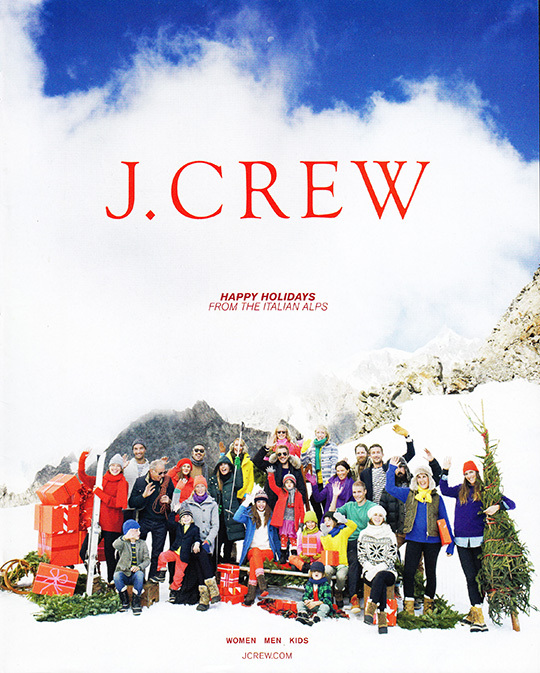 (Reminiscent of the Hermès 2010 winter ad campaign.) It is always nice to see this icon of the outdoors. 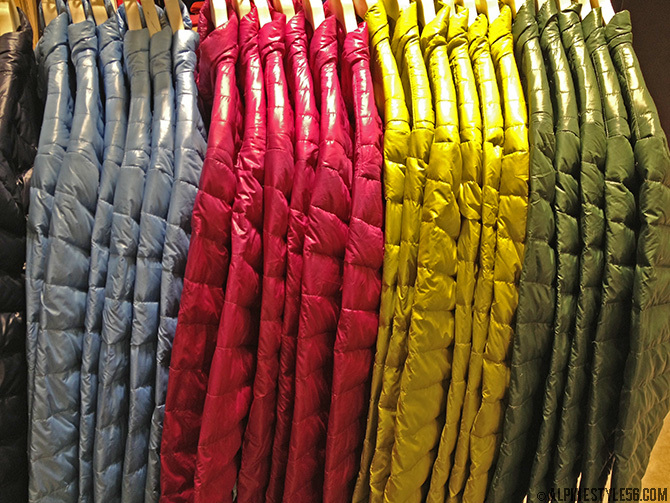 Like Uniqlo, Joe Fresh has an affordable and colorful offering of lightweight down jackets for men and women. 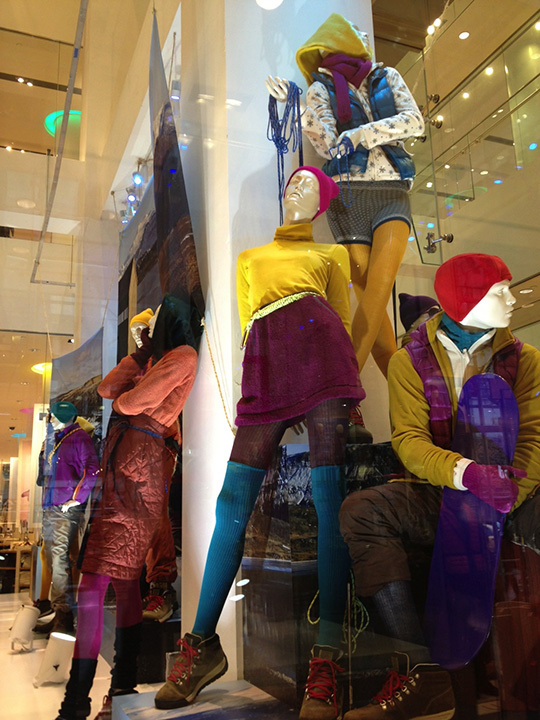 This number at American Eagle looks like a candidate for a fabulous and fun après ski ensemble. 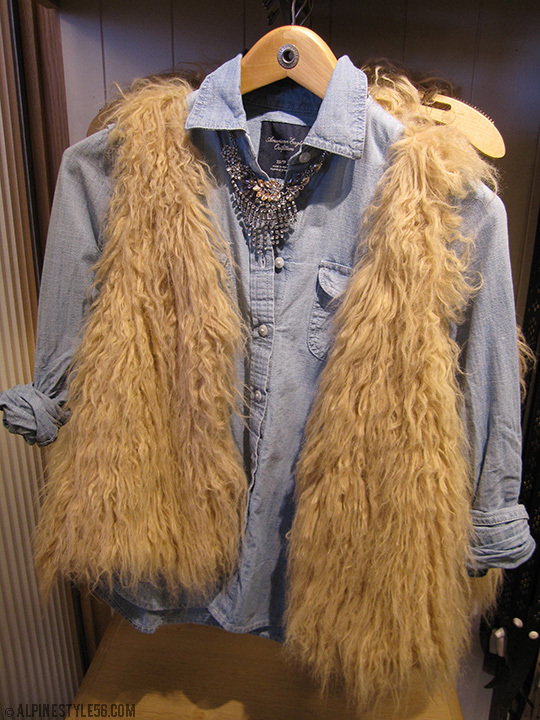 They call it the Shaggy Faux Fur Vest, I’m calling it yeti chic. 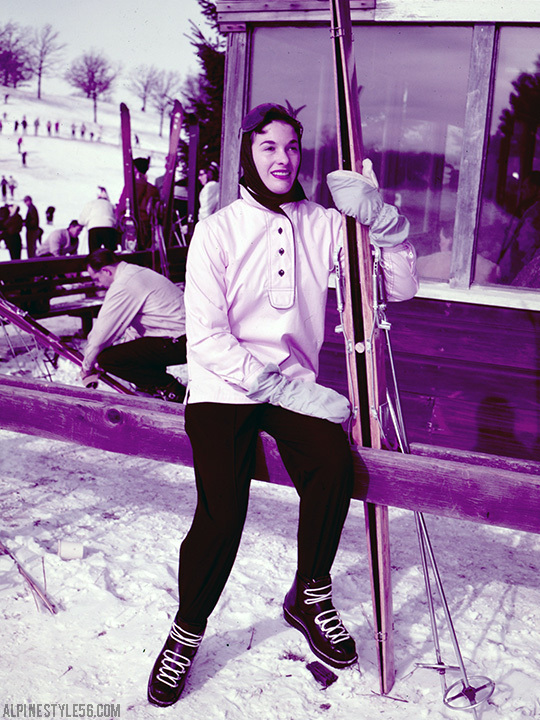 Slope Style: Coming Soon. 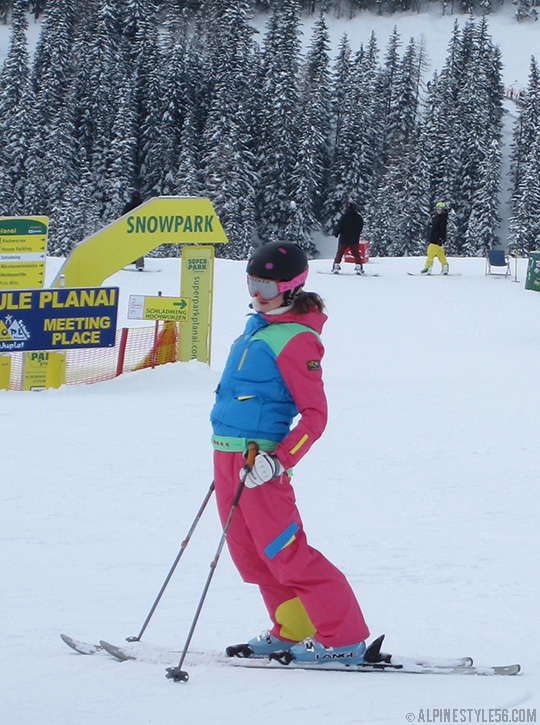 . .
Cheery colorblocking seen in the park at Planai – Schladming, Austria. MJ in her Kjus Nahla Down Jacket. The trademark contrast zipper around the hood perimeter is brilliant! Lots of POC color popping against black and the blue sky. 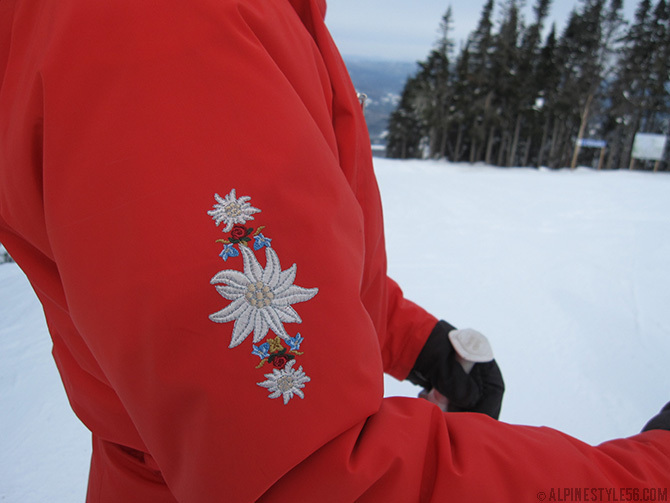 A rare sighting in the Northeast Kingdom – luxury ski wear. 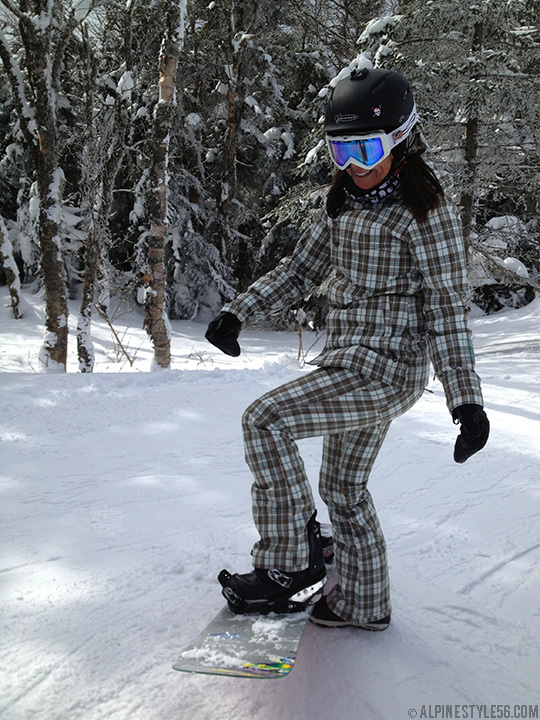 Bogner jacket and Jet Set pants. 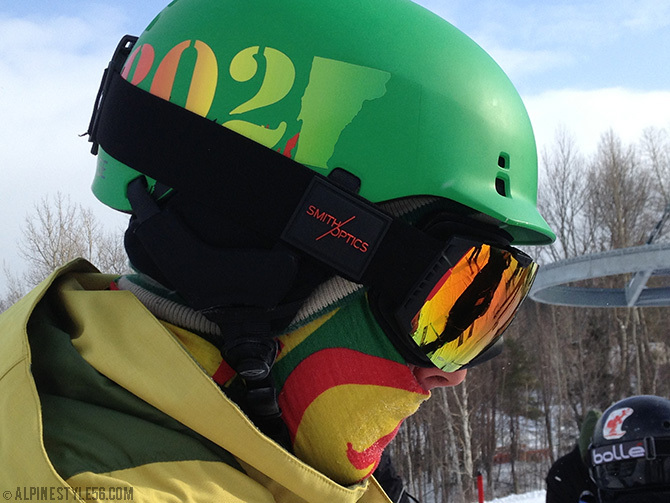 Skiers like classic Burton, too. 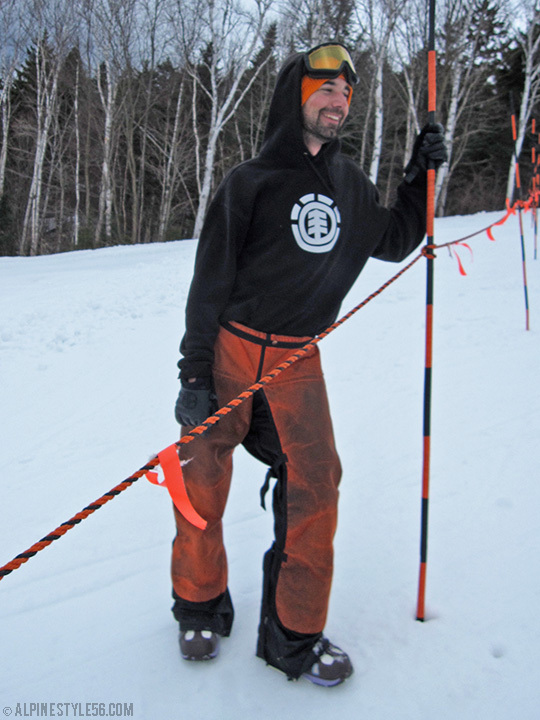 Steve Mahon, Burke Terrain Park Manager and founder of FACE facemasks, looks good and at ease in Husqvarna protective chaps. 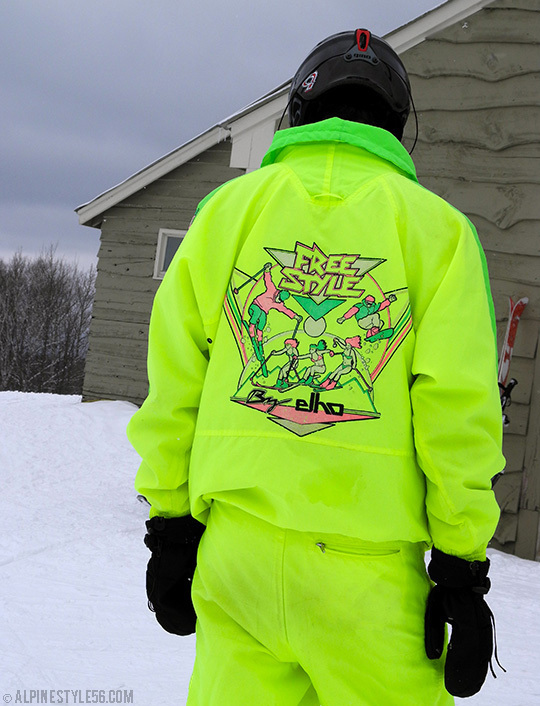 Elho Freestyle suit, a 1980s gem in all its neon glory. 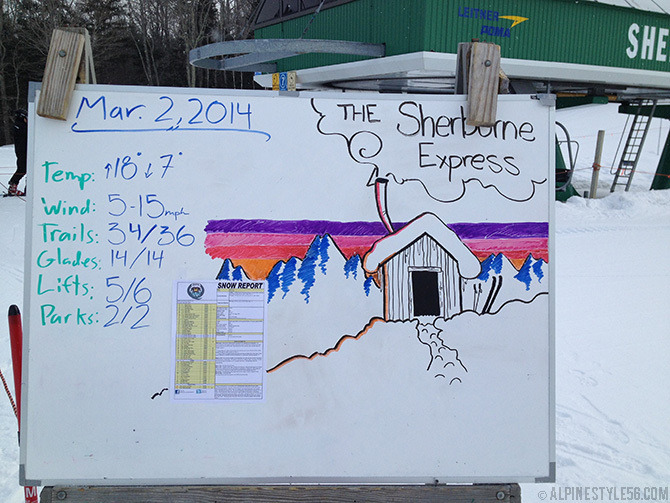 Ski season has arrived in the Northeast and Thanksgiving should be a pretty good day on the slopes! I am looking forward to another winter of seeing what apparel and accessories people are wearing and more interestingly – the style element of how they put it together and carry it off. 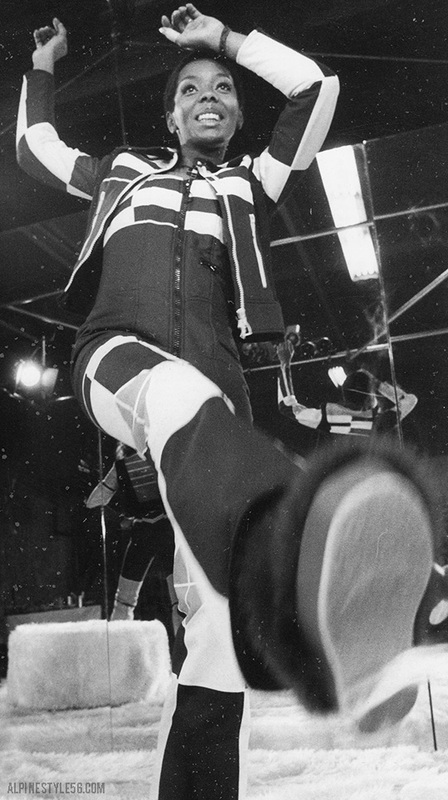 New, original style photos are coming soon. . . until then, here are a few shots from last winter. Enjoy the holiday! 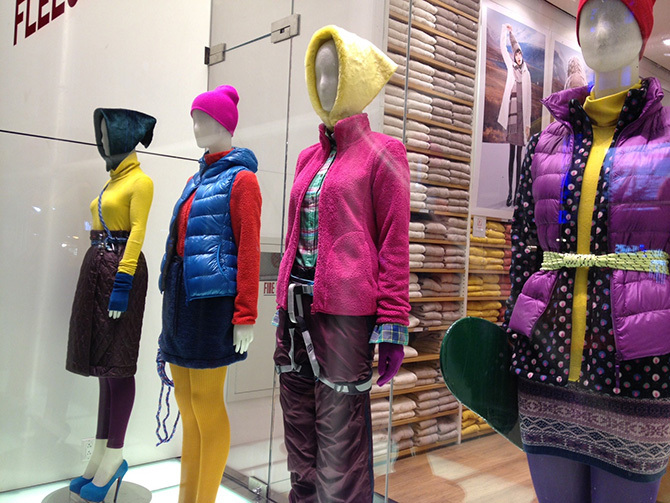 Uniqlo is alpine-themed! 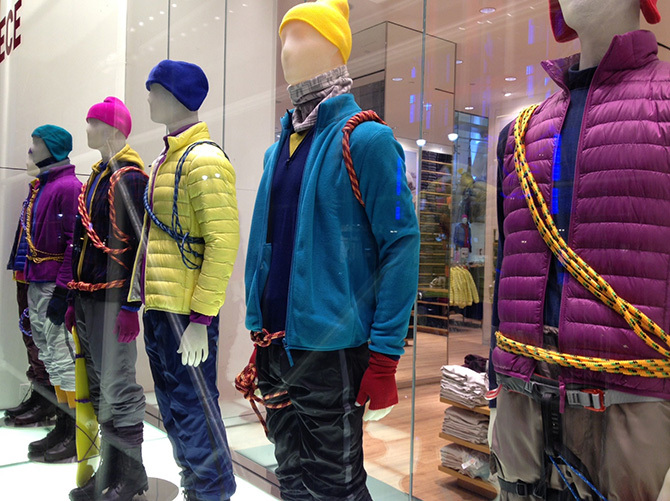 All windows and displays in the 34th Street Manhattan store are outfitted with this mountaineering-inspired look to promote the Ultra Light Down and Fleece programs. Climbing rope, harnesses, sky-high heels and skateboard decks – somehow this mash-up works to merge outdoor with fast fashion. x x Photo Credit: All images J.Crew, from catalogs or Pinterest.